Bluegrass Jam, with the Fox Crossing String Band – Jams are open to musicians of all skill levels and experience, and each jam will be facilitated by jam-seasoned musicians. Spectators welcome. Blues Jam, with the Blues Deacons – Jams are open to musicians of all skill levels and experience, and each jam will be facilitated by jam-seasoned musicians. Spectators welcome. Champaign County Historical Archives Bazaar – Discover artifacts, photographs, documents, films, maps, and more held in the incredible archival and museum collections right here in Champaign County! Ask professionals how to best preserve your memories, start researching your family history, record an oral history, or ask about the history of Champaign-Urbana and Champaign County. Door prizes, books for sale, and more! 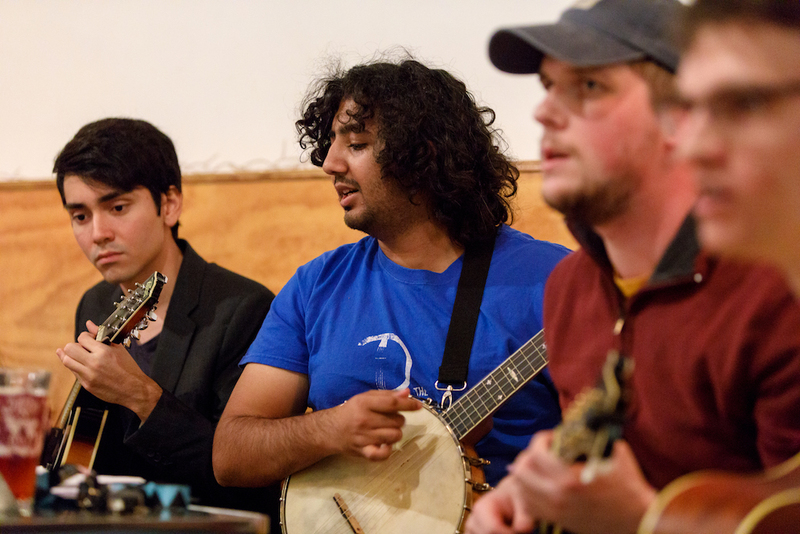 Hootenanny, with Sam Payne and Dustin Norder – The Urbana Hootenanny comes to the festival! Sam and Dusty will host an open stage to close out the festival. All acoustic instruments and styles welcome. And it’s also very possible that open jamming will ensue! Irish Session, with Leandra Baker – Jams are open to musicians of all skill levels and experience, and each jam will be facilitated by jam-seasoned musicians. Spectators welcome. Musical Mayhem Parade, led by John of the Wandering Boys – The parade is back! Bring your instruments, costumes, and free spirits and celebrate on the streets of downtown Urbana. Old-Time Jam, with Claudia Kaufman – Jams are open to musicians of all skill levels and experience, and each jam will be facilitated by jam-seasoned musicians. Spectators welcome. Open Jam Session, with the Pickin’ Illini – Come join members of the Pickin’ Illini in an old-fashioned, pickin’-style jam! If you love to pick bluegrass, blues or folk, or just want to sing along, then pull up a chair and join us in playing through some great tunes, old and new! All ages and skill levels are welcome. Sea Chantey Sing, with John Morris – Join the Chambana Chantey Sing for an open song session. We’ll sing chanteys (sailors’ work songs) and forebitters (recreational songs), songs of the oceans and inland waterways, songs of fishing, of the docks, of the taverns, and of home, songs both traditional and modern. Lead a song, sing along, or just listen. Shape Note Singing, with the Sacred Harp Singers – Shape-note singing is a musical-notation system developed by 18th-century itinerant American singing masters to quickly teach 4-part unaccompanied vocal harmony for use in worship. No longer connected to any particular church denomination, today the unique harmony, full-throated energy and community experience embraced by Sacred Harp (songbook) singers appeal to participants from all walks of life. Experienced singers will lead as everyone is invited to join in. Song Circle, with Jordan Kaye – All are welcome to join the singing in front of a roaring fire with Jordan Kaye, everyone’s favorite Prairie Dog. We Wanna Woke Justice Choir – All are welcome to sing along with members of this choir, who gather together to sing songs of social justice.